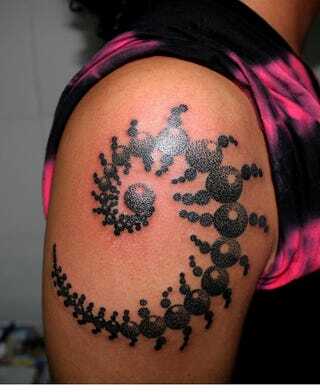 I am an "ink virgin" (and have no plans for a tattoo), but I know a lot of people on GT have tattoos, and are looking for some interesting patterns, so when I was looking for something else, I found these, and thought people might find them interesting/inspiring; fractal pattern tattoos. A new, and very modern change from the traditional navy style tattoos, Celtic knotwork, or even the Japanese style that's become popular recently. They're based on the patterns one sees in chaos theory (I'm not a physicist, so don't ask me to explain! ), like frost on a window, for example. The workmanship on many of them is astonishing as well, with really finicky stippled shading and glorious colours on some as well. I can't find credits for most of the images; where I can, I'll give them. And of course I expect kinja to screw up the captions/images.